Farmed responsibly to organic standards. 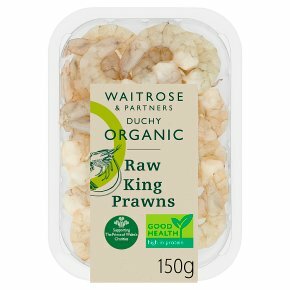 Good Food - Succulent organic king prawns, sustainably farmed in Ecuador. Delicious in stirfries, salads, curries and pasta dishes. Good Farming - Farmed in a way that respects the environment. Good Causes - Sales of Waitrose Duchy Organic products provide a donation to The Prince of Wales's Charitable Foundation. This year, over £2.5m will be donated to the Foundation, supporting good causes across the UK. Since 2009, you've helped to raise over £17m for initiatives such as the Duchy Future Farming Programme, which helps farmers develop more sustainable farming practices. Pan Fry. Time: 3 - 4 minutes. Remove all packaging. Heat 1 tbsp. of oil in a frying pan, add prawns and stir fry over a medium heat, stirring occasionally.